Being new to the F# world, I was feeling lost and confused. However, after few days of reading and watching, and of course being inspired by F# usergroup in Sydney, I was able to gather some confidence to start building something. This post is not about sharing my experience, rather it is a “write as I go” post. And, honestly I don’t know how it is going to end. Okay. So, I have decided to create a simple calculator using TDD in F#. “Calculator” sounds a simple project. However, my goal is to solve this simple problem in very modular fashion so that in the end I have better understanding of how to organize F# modules, codes and tests. I will probably divide the whole process of developing the calculator in few blog posts. The code will be available in the git repository here. I want to develop a calculator which can do basic arithmetic (like add, subtract, multiplication, division, etc.). It will take a valid arithmetic expression of supported operations and will provide the result. In case of any error during the calculation process (e.g. invalid or malformed expression, divide by zero, root of negative one), it will raise exception with proper error message and terminate the process. At this point, with the requirement in mind, it is very tempting to start writing tests to enforce calculator behavior. However, I would like to take a moment to discuss the problem further and how I can make small reusable components that can be used later in this project (or, even in other projects). I always find the task of parsing infix arithmetic expressions a bit difficult. So, I would like to “ignore” this task for now. Rather I would do something simpler- which is parsing Reverse Polish Notation (RPN) . I believe, I can deal with converting from infix to RPN later. Well, to parse and compute RPN, I think a stack is mandatory. So, I will first concentrate on creating a generic stack. Then I will move towards creating RPN calculator and as a result- a fully functional infix calculator. In this part, I will only create a stack. It should be a simple task to create a stack with few lines on code in any language. But, again, I am focusing more on organizing the solution and how small pieces fit together in F#. So, I will move forward slowly and will have very elaborate description of creating stack as I go- like baby steps. Once things start looking good, I will start running. 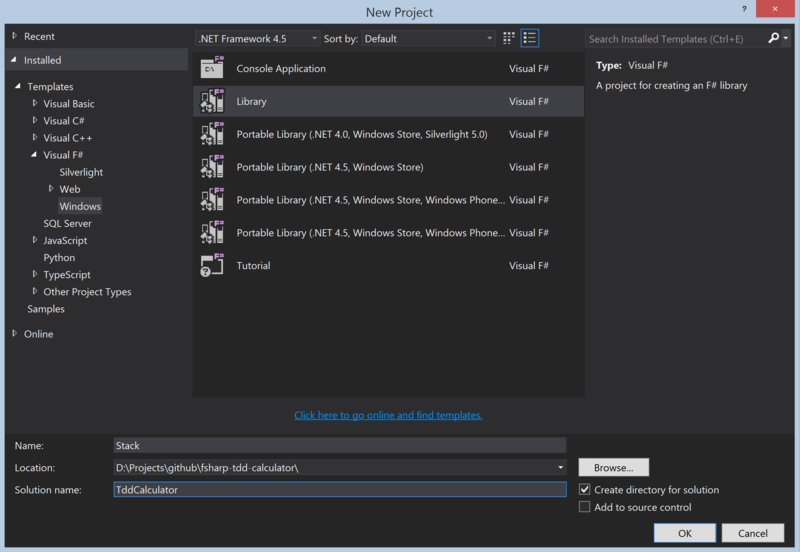 Let’s start by creating a F# project first. 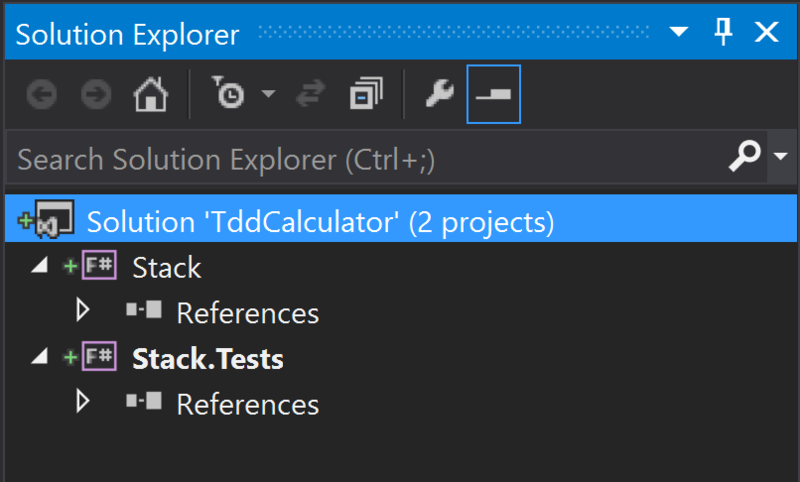 I named the project Stack and named the solution TddCalculator. I choose it to be Library type project and checked the “Create directory for solution”. 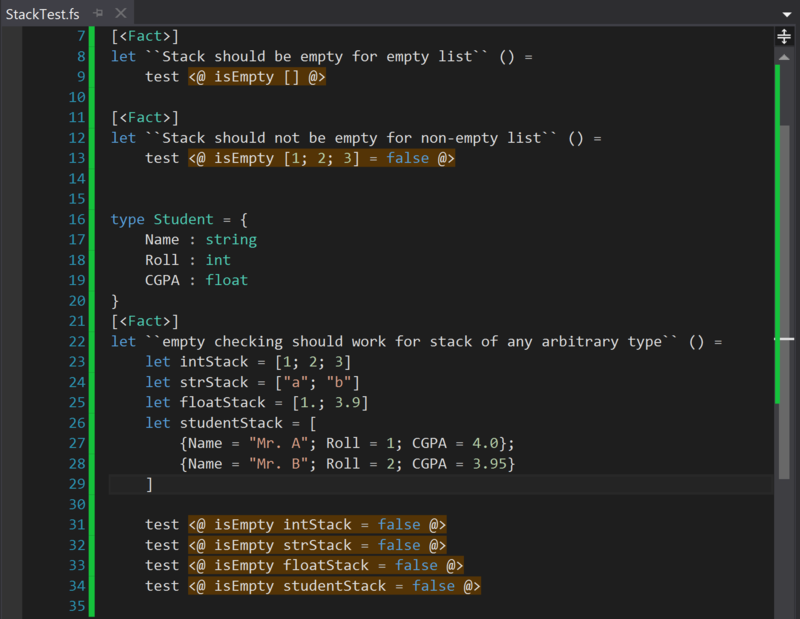 Finally, added a reference of Stack project in Stack.Tests project. That is all the setup I need to start coding. To more serious reader, apologies to make such a simple thing so complicated. Actually implementing isEmpty was just to check if the whole setup works. Looks like it does. Let’s start taking bigger steps towards real things that we will need. Let’s implement push and pop. I want push method to take an element and a stack and return a new stack containing the new element at top. 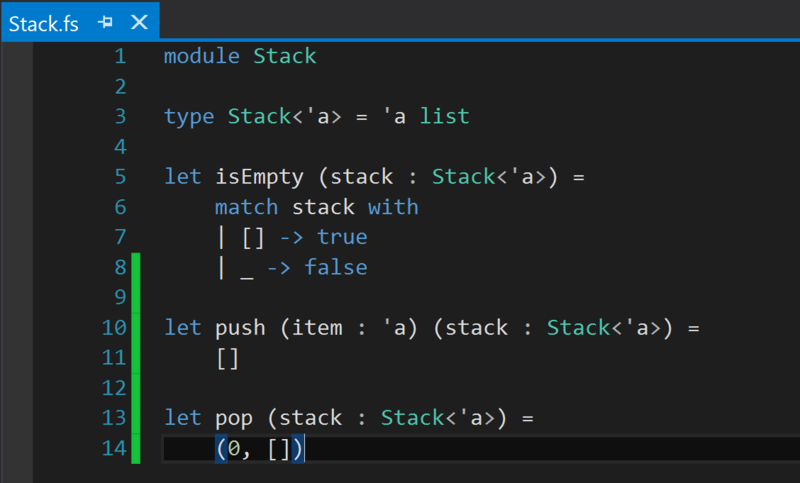 And, I want pop method to take a stack and return a tuple containing the top element and rest of the stack. All tests are passing now. 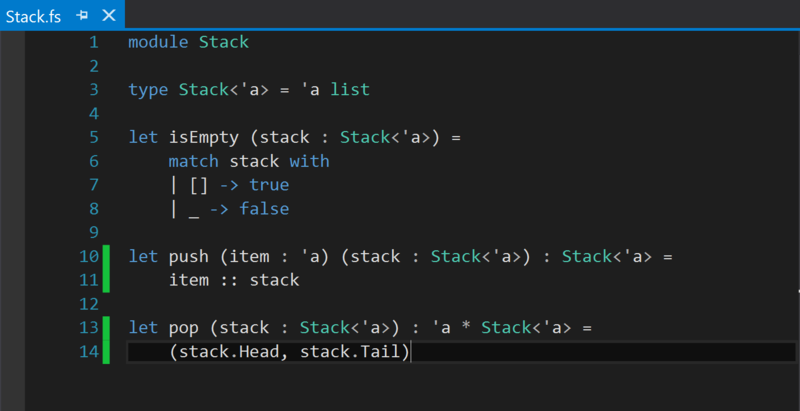 I am happy with current stack implementation. It is behaving the way I want and I can change any behavior later with confidence as I have tests backing me up. That’s all for this first part. In next part, I will try to do something useful towards developing the fully functional calculator with this simple stack. Spotted a typo? Better ways to express? Feel free to contribute it. Zp Bappi is a technology lover, great fan of designs and patterns (both of them together as well) and likes to play with anything cool. When he's not writing code or reading blogs, he may be sleeping or eating somewhere. No comments yet on this post. Why don't you be the first one? By the way, you will need a GitHub account to comment.